Easy to set up and use: just move it! 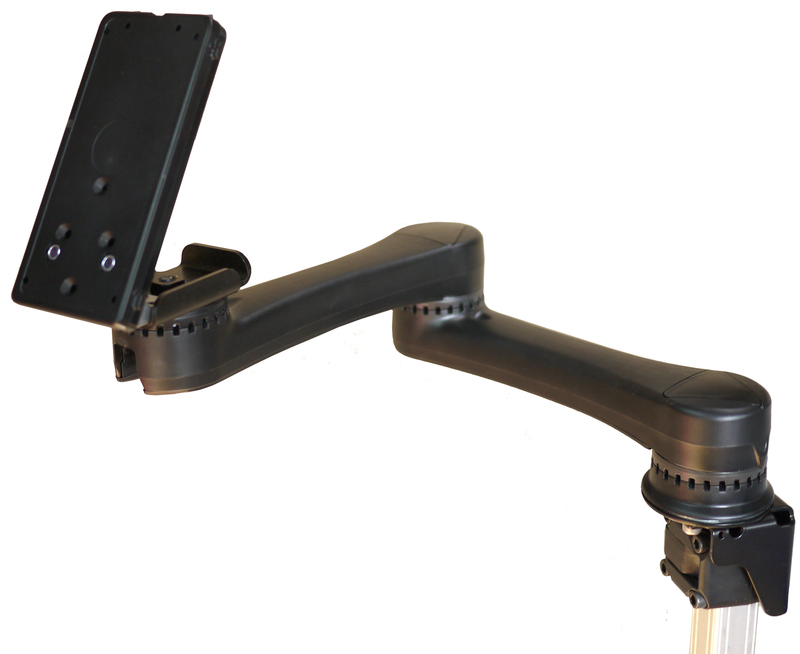 Movable mount for speech devices, trays, cameras, and more! Easy and intuitive to use--just move it! Have the person try it out--can they move it? do you want them to move it? Weight: 2 pounds 15 oz. The Easy Mover Tilt'n Turner allows you to attach a device using a Quick Release Plate (QRP) and tilt and turn it. Quick Release Plates can be attached to the Tilt Plate, which is attached to a Link Bracket via a resistance hinge. It can swivel in a horizontal plane, and the resistance to swiveling is able to be adjusted. A person can choose a High or Low hinge resistance. Neither the tilt or rotation functions can be locked in place. The Link Cube provides a means of attaching a post in one of 3 configurations--outside the Link Bracket, to a vertical or horizontal post; or inside the Link Bracket. Move and adjust it yourself. It's Simple. The Simple Mount Large offers a simple, stable, cost-effective and versatile mount for tablets, phones, remotes, switches, eating, reading etc. The Simple Large includes a post with a plate attached to a variable angle hinge, allowing positioning of devices at a range of angles (0-90 degrees) and rotation (360 degrees) for optimal viewing and access. It can flip down alongside the post for storage and transfers. There are no locks or mechanisms. It is simple, but very useful. Attach things with velcro, double back tape or other methods. Two Lip Supports are included in the kit to provide edges to keep things from falling off the polycarbonate plate. May be used with a Dual or Single Arm Mount'n Mover to create a Double-Decker. The Simple Mount Small offers a simple, stable, cost-effective and versatile mount for phones, switches and remotes. The Simple Mount Small includes a post with a plate attached to a variable angle hinge, allowing positioning of devices at a range of angles (0-90 degrees) and rotation (360 degrees) for optimal viewing and access. It can flip down alongside the post for storage and transfers. There are no locks or mechanisms. It is simple, but very useful. Attach things with velcro, double back tape or other methods. One Lip Support is included in the kit to provide an edge to keep things from falling off the polycarbonate plate. Additional Lip Supports sold separately. The Tilt'n Turner is our most compact mount featuring one rotational joint, referred to as the wrist, and 24 possible lock positions. It does not swingaway and is accessible on the side where it is mounted. <1.5 pound pressure to unlock. Force to move varies with device weight. Adjustable friction screw changes force required to move it. Force to adjust tilt depends on torque hinge selected. Accessible to hand on the side it is mounted to. The single arm is more compact than the dual arm featuring 2 rotational joints, referred to as the shoulder and wrist. It is simple to move and has 576 possible lock positions. <1.5 pound force to unlock. Force to move varies with device weight. Requires more reach to move out of the way. Less placement versatility than dual; fewer locking and operating positions. This is our most versatile & flexible mount. It is the easiest to move and requires little reach. The dual arm features 3 rotational joints, referred to as the shoulder, elbow, and wrist. And 13,824 possible lock positions. 1.5 pound force to unlock. Force to move varies with device weight. Requires some lateral (side to side) motion, but very little forward reach.